Spot gold was steady at $1,276.36 per ounce as of 0324 GMT, after having fallen as much as 1.2 percent to $1,272.70, its lowest since Dec. 27, in the previous session. U.S. gold futures were up 0.1 percent to $1,278.80 an ounce. China's pace of economic growth in the first quarter remained steady at 6.4 percent, beating expectations of a growth rate of 6.3 percent, helped by a sharply higher factory production. The data, which signalled that Beijing's recent stimulus drive might be paying off, swung Asian shares higher. "With the (Chinese) data that we've got, it certainly adds a bit of a downside to gold from here," said IG Markets analyst Kyle Rodda. "The fact that we have broken below the key $1,280 level might make it difficult for prices to recover." "Signs of progress in U.S.-China trade negotiations and strong U.S. economic data have further bolstered risk appetites since the start of the second quarter," Phillip Futures said in a note. "The precious metal looks poised to undergo a bearish correction amidst growing downside risks in the near term," the note added. Gold, a non-yielding asset for investors looking to hedge against times of economic and political uncertainty, loses appeal when interest-yielding equities rise. 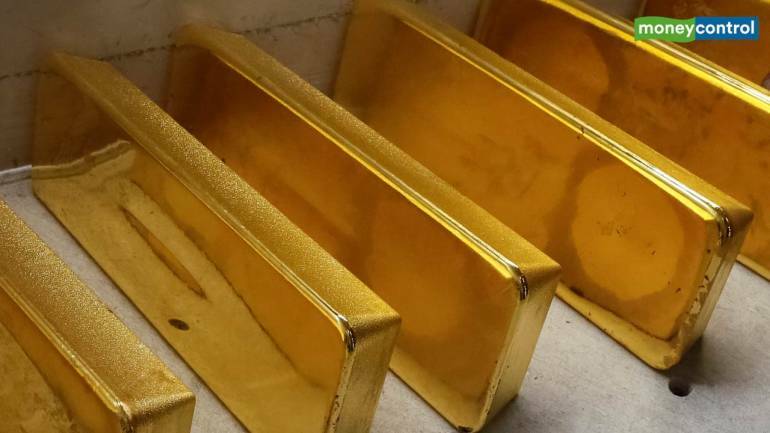 A gauge of investors' interest in the metal, holdings of SPDR Gold Trust, the world's largest gold-backed exchange-traded fund, fell to a near six-month low to 752.27 tonnes on Tuesday. Elsewhere, silver gained 0.2 percent to $15 an ounce. Spot platinum rose 0.3 percent, to $879.50 per ounce, while palladium climbed 0.4 percent to $1,355.46. The recent weakness in palladium prices was instigated by a conjunction of profit-taking and poor car sales data in China and the U.S., Metals Focus said in a note on Tuesday.